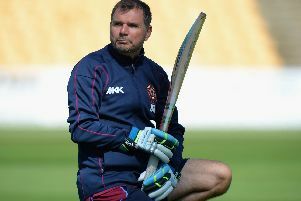 David Ripley admits only a win will do for Northants Steelbacks as they travel to Worcestershire Rapids on Sunday looking to keep their Royal London One-Day Cup campaign alive. At the halfway point of their eight group matches, the Steelbacks have only won once. They now face back-to-back games, with Somerset visiting the County Ground on Monday afternoon. With the top four qualifying for the quarter finals, Northants are already three points adrift of fourth place, leaving little room for any further defeats in the second half of the competition. Ripley’s squad also travel to Canterbury on Tuesday morning to start a County Championship Division Two game against Kent, and after losing their last two matches four-day matches, the head coach knows it’s a crucial few days for his side. “I think it is, no doubt about it,” said Ripley when asked if Sunday’s game was must win. “We have back-to-back games next and we’re going to have to play very well to keep ourselves in the competition. “I can’t see three wins being any good, especially with the pretty poor run rate from the Surrey game. That’s going to dent us if we finish on similar points so we’re going to have to win these two games to keep ourselves alive and that’s our intention. “We’ve got two games in two days and then down to Kent so we’ve got six in six which is going to test the squad a little bit but we do need to have a good six days. Ripley is hopeful that captain Alex Wakely will return to lead the side at New Road having missed the last two games with a finger injury. However, Adam Rossington will miss out after a back injury forced him to pull out of Friday’s defeat at Derbyshire Falcons after the toss had been made. Ripley said: “Injuries are just biting us a little bit, we’ve lost Adam Rossington before the game (at Derby), we hope Alex Wakely could be back but Rob Newton isn’t on the horizon just yet. “He’ll (Rossington) have a scan on Monday and we hope it’s nothing too serious that will keep him out for any length of time, it’s a little back injury, that has been brewing up a little bit.